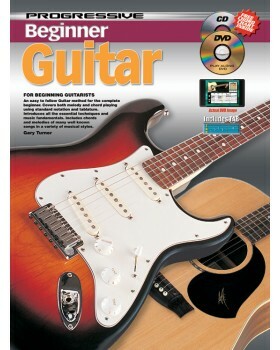 Teach yourself how to play guitar with our easy guitar lessons for beginners. 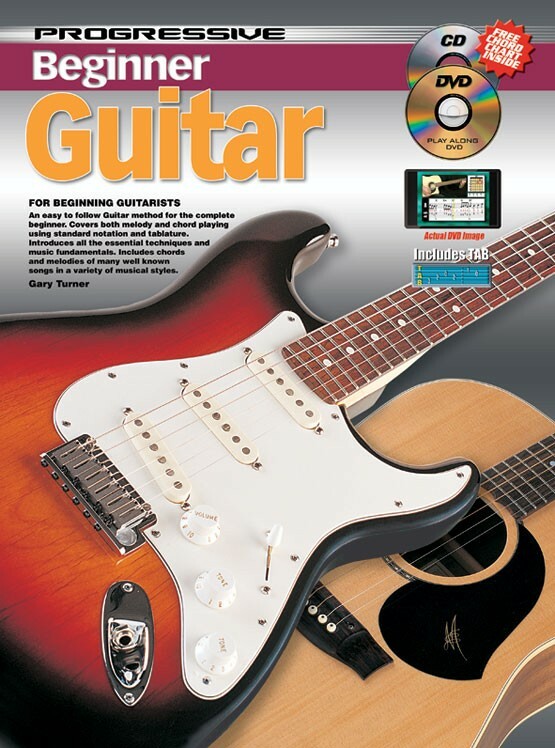 Progressive Beginner Guitar contains all you need to know to start learning to be a great guitar player - in one easy-to-follow, lesson-by-lesson guitar tutorial. Suitable for all ages and all types of guitars including acoustic guitar and electric guitar. No prior knowledge of how to read music or playing the guitar is required to teach yourself to learn to play guitar from this book. LearnToPlayMusic.com's guitar lessons for beginners are used by students and guitar teachers worldwide to learn how to play guitar. For over 30 years, our team of professional authors, composers and musicians have crafted guitar lesson books that are a cut above the rest. We offer a huge selection of music instruction books that cover many different instruments and styles in print, eBook and app formats. Awarded the 'Quality Excellence Design' (QED) seal of approval for eBook innovation, LearnToPlayMusic.com continues to set the standard for quality music education resources. I am a full-time private guitar instructor who has also played in bands for over 40 years. Since in all that time I've never known any bandmates (besides me) that could read standard music notation, I found it really frustrating that every beginner book I could find insisted students learn "to read music." To the point I was over 20 pages into writing my own book, when I came across the Progressive Beginner Guitar Book. Problem solved! Besides showing lessons in standard notation, it shows notes in standard guitar TAB (tablature), and chords using standard chord diagrams. This is how actual guitar players read music 99% of the time. This book also avoids the problem of making students learn bad music cooked up by the author to get around copyright problems. Instead this book teaches familiar favorites that are old and traditional enough there is no copyright issue. There is nothing more de-motivating than having to learn lousy non-songs with names like ""B-string boogie"" etc. The book is laid out logically and each lesson teaches just enough new stuff to keep students motivated and moving forward. After a lesson or two I supplement the book with chords for songs that the student brings in - songs they like enough that they'll practice them, and songs they can hear in their head without having to go look them up. Everything is clearly laid out with multiple ways to learn - for instance, new chords are shown as diagrams, as well as with a photograph of the chord being played properly, plus there is a audio recording to listen to, and video content if that isn't enough!